With snow shoveling, specially the wet heavy stuff, comes the increased incidences of heart attacks and back injuries. The reason for the heart attacks, while shoveling, is over stressing the heart with exertion. The two main reasons for this are: 1- lack of physical conditioning and 2- trying to get the job done too quickly. You need to know your limits and you need to pace yourself. However, when the snow falls, and you need to get to work, the scramble is on to move as much snow as quickly as possible. Hence, the heart attack or injured back. Learn how to Rake Leaves Without Back Pain. Why does raking leaves cause back pain? Most of the time this is because you are unwittingly straining the back muscles and joints of the spine.. It doesn’t have to be that way. Using proper body mechanics when raking, as well as performing other chores around the house, can greatly reduce back pain, strain and other injuries. 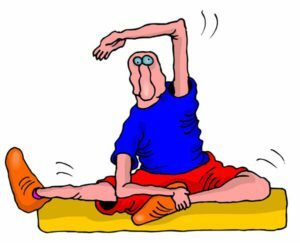 A Primer of Stretching Exercises: Why, what, when and how to stretch. Stretching reduces aches and pains of daily living. Strength training and cardiovascular (aerobic) exercise are essential to maintain the required strength and stamina for daily living. However, stretching and flexibility exercises will reduce the stress and strain on your body that happens due to the loss of flexibility suffered with aging. Stretch Your Hamstring Muscles to Decrease Knee Pain and Back Pain. The hamstrings are the muscles on the back of the thigh. The three hamstring muscles are responsible for bending at the knee or flexing the knee. Hamstring tears are often the reason you see sprinters pulling up in a race. 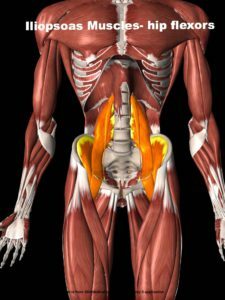 The hamstrings attach to the part of the pelvic bone which you sit on. When tight, they can tilt the pelvis backward, flattening the lower back. This can adversely affect the mechanics of the back and pelvis, which can strain your spine and hips. Like the quadriceps, tight hamstrings are often contributing factors of low back pain as well as knee pain.